FIELDON - The area has been hit hard the last few weeks with high winds and lightning strikes. A couple in their 60s died of smoke inhalation this past week in Troy when their house was apparently struck by lightning. 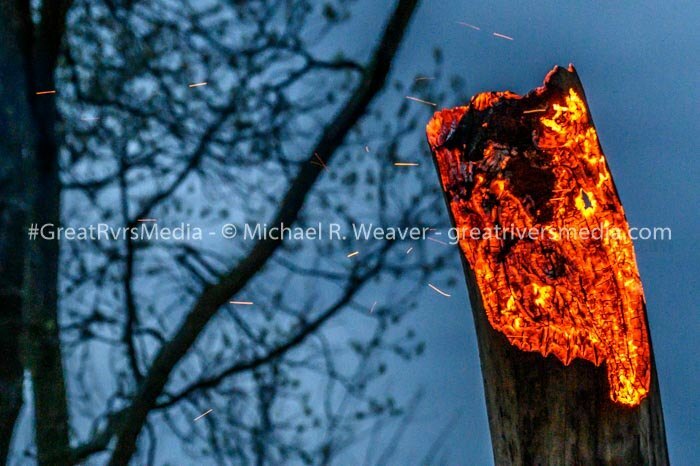 On Thursday night, photographer Michael Weaver was stunned to see a blazing tree top on 610 East County Road in Greene County about a mile north of Reddish Ford Road Bridge. Apparently, the dead tree had been hit with lightning just before the photographer passed the area. The dead and barkless tree stump was about 20 feet in the air, Weaver said. Lightning had been striking in the area previously to Weaver's discovery. There was nothing burning around the tree and no one present, so Weaver believed it likely was a lightning strike since there was no evidence of "anyone with a ladder and a lighter or anyone burning anything in the vicinity". "I have never witnessed anything like this burning tree visual," Weaver said, a photographer for 48 years. "It was one of the most bizarre things I have ever seen in my career. It looked like a bright orange yellow torch on top of a dead tree trunk with burning embers streaking against the stormy and dark sky, it was very strange."